During the cold and dark Michigan months, it can be easy for the winter lull to affect your business. Although a lot of corporate team building activities take place through the spring and summer, winter could be a great time to get out of the office and get motivated together. There are several beautiful and unique locations in Flint & Genesee available for booking your next corporate-team building workshop. Some are rather new; others have been around for many years. One of the newest locations is the Flint Institute of Art’s Hot Shop. 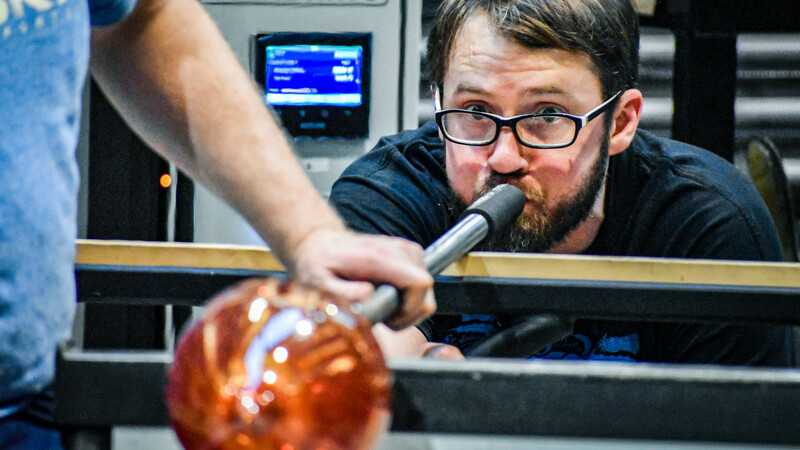 Describing it as a hands-on, intense team activity where participants must work together to complete a finished product, instructor and Glass Programs Manager Brent Swanson has been busy helping local corporate groups build camaraderie while learning the foundations of glass blowing. “This is a typical practice at glass facilities around the country,” said Swanson. 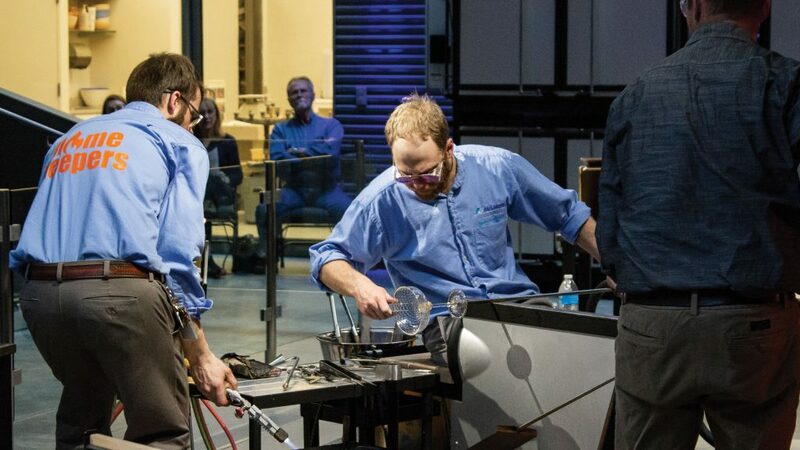 “In other glassmaking companies, I have seen hundreds of companies participate in these types of team building workshops. 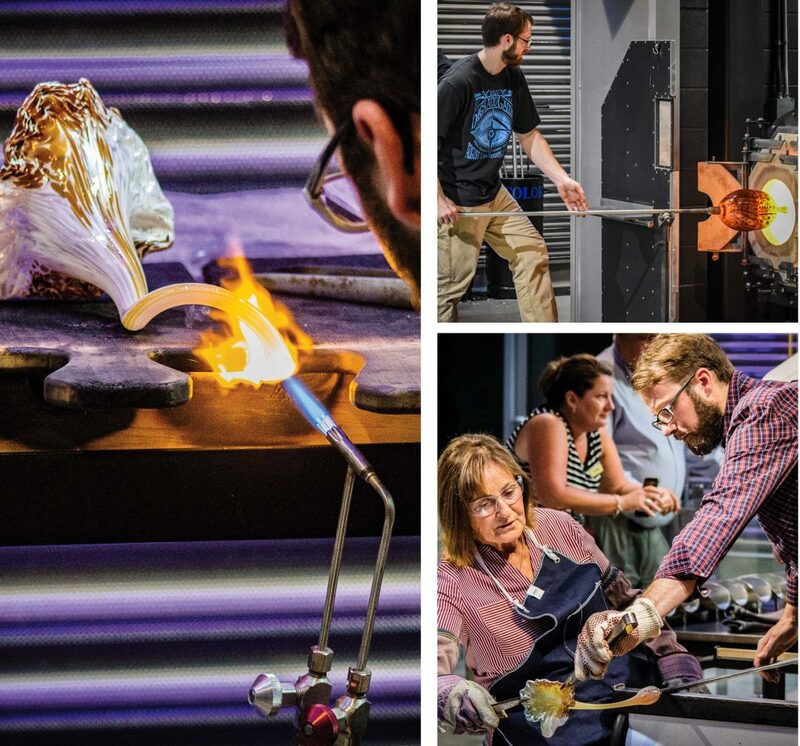 Offering workshops, soirées, courses, private lessons, classes, events and residencies, the FIA Hot Shop has glass classes for all ages (16-99) as well as free glass blowing demonstrations hourly on Saturdays from 11 a.m.-4 p.m. The YMCA Camp Copneconic offers team-building activities – both indoor and outdoor – as one of its year-round programs. Located on 750 acres in Fenton Township, it offers a faraway feel to a variety of local businesses. Camp Copneconic offers great flexibility in terms of space. Depending on the group’s size, it accommodates smaller meetings in the cabins and have other spaces for larger groups, up to 400 people. Just like the sizes of groups vary, the focus and length of the team-building session varies and is built off what the business needs. 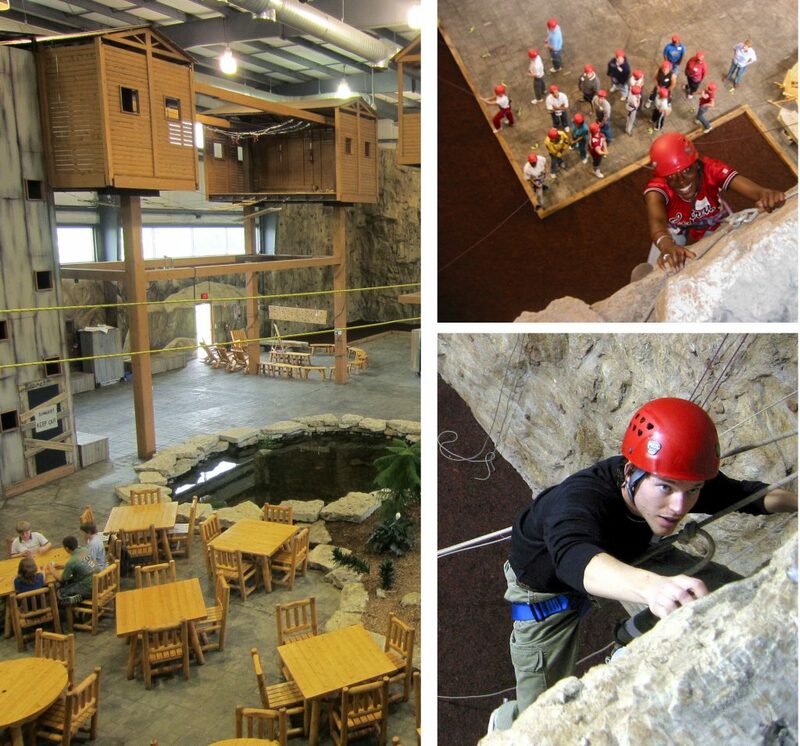 Camp Copneconic features three zip lines, a climbing wall, a high-ropes course and a giant swing. Although all activities are not available depending on the weather, Camp Copneconic has outdoor, physical activities as well as indoor initiatives to help businesses during the winter months. Another destination is Base Camp Challenge Center, a program of the Genesee Career Institute. Located on Torrey Road in Flint Township, Base Camp broke ground in 2000 and offers team building based on the business’s specific needs. Base Camp features a high-ropes course and low-ropes course along with an escape room as part of the high rope activities. It also boasts a rock wall unlike any other in Michigan, Munsell said. The rock wall stands 32-feet, with 10 different routes. Each route is leveled to accommodate a range of skill levels. To make it more challenging, climbers can be blindfolded, wear weighted vests or be tethered to another person so they have to move at the same height. An important element of Base Camp is that every member of the group feels successful. With its motto “No participant left behind,” Munsell and the rest of the team do everything they can to make all of the activities as accessible as possible.